While USD is being empowered, GBPUSD is chiefly under the influence of FOMC meeting minutes and the FED economic and monetary policy. 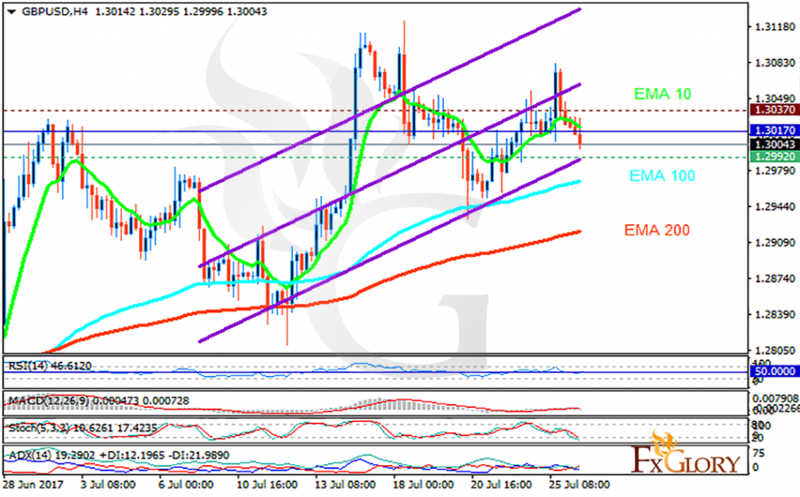 The support rests at 1.29920 with resistance at 1.30370 which the weekly pivot point at 1.30170 is located in between the lines. The EMA of 10 is moving with bearish bias but it is above the EMA of 200 and the EMA of 100. The RSI is moving horizontally on the 50 level, the Stochastic is showing downward momentum and the MACD indicator is in neutral territory. The ADX is showing sell signals. The support are of 1.29 level seems to be too strong to be broken therefore GBPUSD may continue its bullish trend towards 1.31.